We finished the book of Deuteronomy! The past three weeks seemed to have been the longest of all in this stretch of reading so far. As the children so poetically put it last night, "Moses died and now we get to read about Joshua and the battle of Jericho!" It slightly concerned me with how pleased they seemed that Moses died. I get it though. They were ready to move on. There is a large amount of repetition in Deuteronomy. But there was a stirring in my spirit as I read the final chapter. The details. I felt like I was watching it all unfold before my eyes. A faithful servant of the Lord was sent up the mountain to view the Promised Land at the age of 120 years old. He had disobeyed the Lord, but God saw fit to still use him for His honor and glory. He allowed Moses to see the "prize", but as punishment, he was not allowed to enter. Moses already knew he wouldn't be allowed into the land, yet he was still faithful to the Lord as he diligently lead the children of Israel. It makes me stop and question if I have been guilty of wondering aimlessly in the wildness due to lack of obedience. Over the past 16 weeks, we've read many accounts of God punishing people in a variety of ways. My kids have made references to these casually over the past weeks, but they surprised me Sunday at church during their children's church service. One of the many hats I wear is also Children's Pastor for our small, local church. Sunday, my husband and I were with the kids at church, and I was teaching on hearing God's voice. 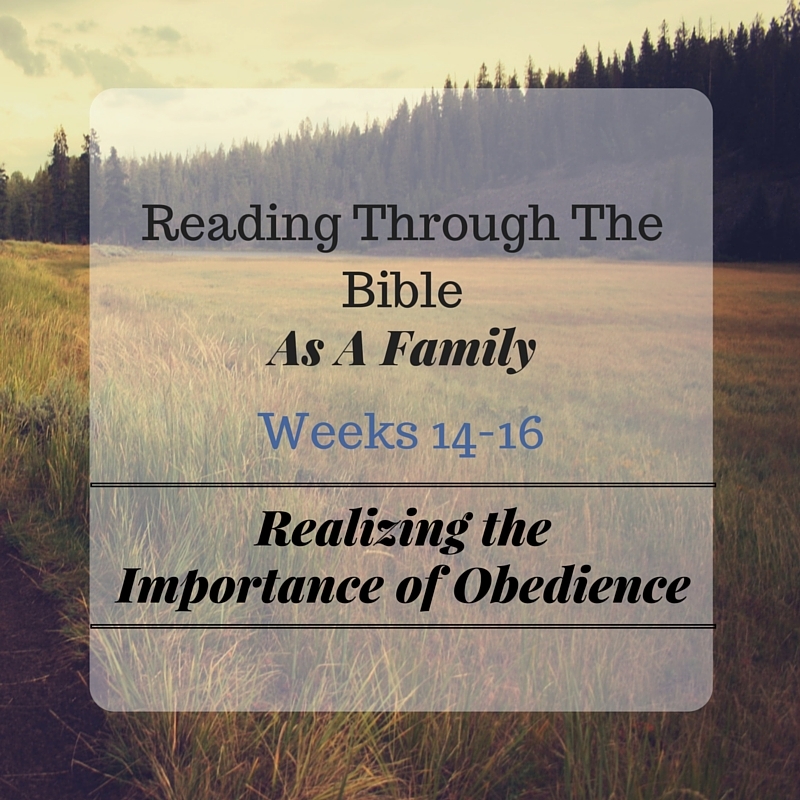 We discussed the fact that sometimes we hear the Lord, but we don't always obey. Several of the kids made comments to the effect that we shouldn't disobey God. To this, my oldest chimed right in to say, "Yeah, we've been reading the old testament. God would just strike people dead, just like that, if they disobeyed." A questioning look came from several of the other kids. Then my youngest spoke up, "What about that one family God just opened up the earth and it swallowed them alive! But it was ok because God warned all the other people not to stand near their tent." They all look to me. Being the children's pastor is fun. They keep me on my toes. I seriously have had to study the Bible more as a children's pastor than I ever did as an adult Sunday school teacher or as family minister. Kids are wide open with their thoughts. If you are silent long enough, they will share exactly what is on their minds. And they are innocent enough that if they don't understand something, they usually have no problem asking questions. I love it. In small numbers. This morning, the kids and I were at the pool. They had made friends with another child at the pool and were happily playing together. Most days, my kids are not as outgoing to want to play with someone they do not know, but recently they have both started being more outgoing with their peers. As a homeschooling mom, this made my heart happy to see. When time was nearing for us to leave, I simply walked over and told them one more jump off the diving boards and then we would have to leave. Big smiles as they jumped in again. But then... their friend suggested they try a "new jump", and they quickly agreed to jump in again. This probably doesn't sound like a big deal, but for my kids, this was not typical behavior. Our Bible reading quickly came to mind. I walked back over as they were climbing out of the pool the second time and simply said, "You both have disobeyed." No voices were raised. No excuses were made. We discussed their lack of obedience for just this one instance and what we had been reading about Moses. The importance of listening the first time was reviewed during this time also. A little time passed in silence and conviction was felt in the van. My oldest apologized, followed up by the youngest as we drove home. I could be wrong, but I truly do not believe they will forget that lesson in the near future. The Lord has a purpose for my family to go through this Bible reading together at this exact time. 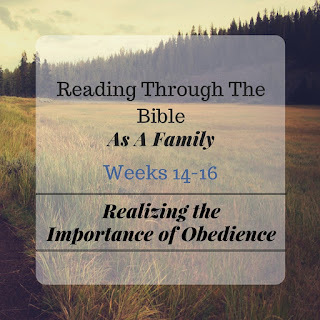 Even though I know my kids do not understand everything, (and I'm certainly not saying I do either) this is giving them a foundation to prepare to go deeper into God's Word. Even some instances like what happened today, I'm thankful for the teaching opportunity.